Hit the target to be rewarded with the satisfying sound of "Gooaall!" 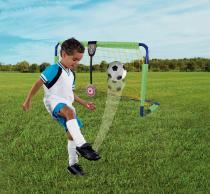 The Fisher-Price Grow to Pro Super Sounds Soccer makes learning to play soccer fun, easy, and rewarding. Every time beginners hit the net, they’ll hear fun, encouraging sounds. And it’s a big goal net to hit – 2 feet wide by 3 ½ feet high – so novices can easily score. As their skills improve, kids have to hit the target to be rewarded with the satisfying sound of "Gooaall!" 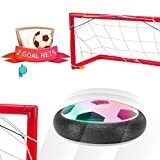 And to make it even more challenging, kids can move the adjustable target anywhere along the goal post so they learn to score anywhere in the net. Little soccer players can score big with Grow to Pro Super Sounds Soccer. Two levels of play and sounds after every goal kick up the fun, and reward developing soccer skills as kids grow. Beginners score fun sounds each time they hit the net. 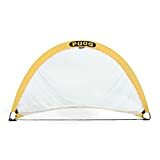 And with this big goal net, beginners are sure to score some confidence, too. More advanced players have to hit the target to hear the announcer shout "Gooaalll"! Add to the challenge by moving the adjustable target anywhere along the goal post. And what better way to learn than with a friend? 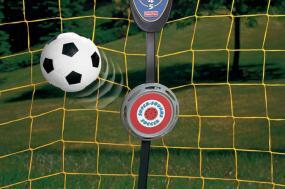 The adjustable target can keep score for two players. 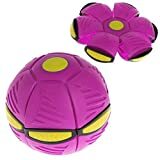 By "dribbling" and kicking the ball, hitting the target and getting healthy physical activity, your little soccer players are developing gross motor skills. They’re also gaining valuable insights on handling and angling the ball, timing their kicks, and how far and hard to kick the ball to get the most success. And as they improve, their confidence begins to soar and they develop a real "can do" attitude. For helping your child develop and grow, this play set really kicks it up a notch. 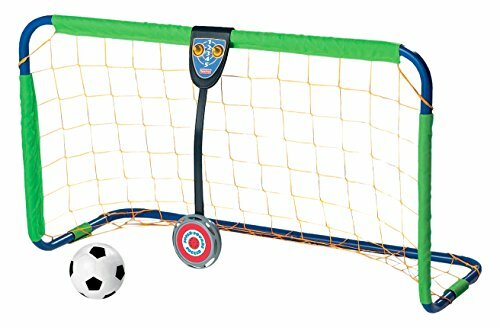 Includes the Fisher-Price Grow to Pro Super Sounds Soccer goal, adjustable target and inflatable soccer ball.